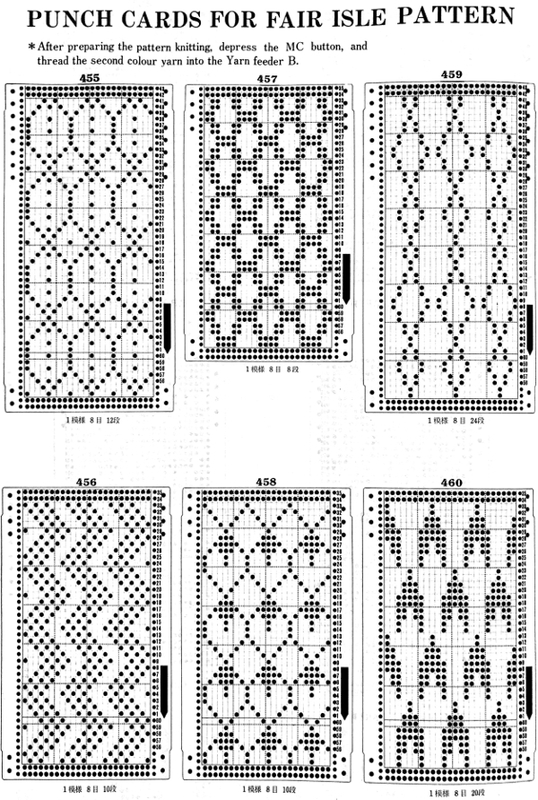 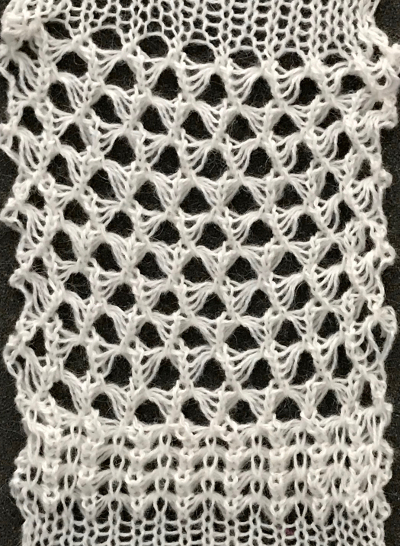 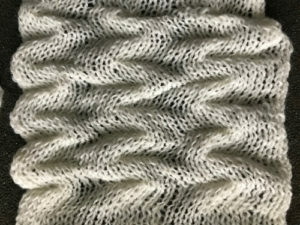 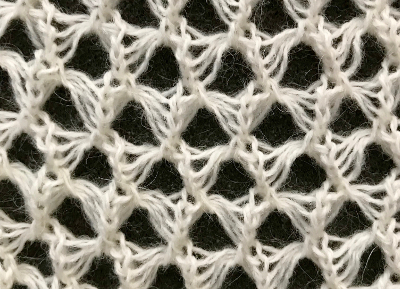 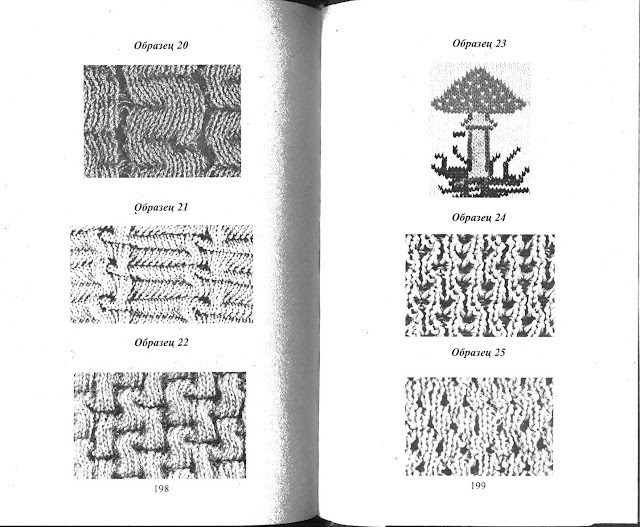 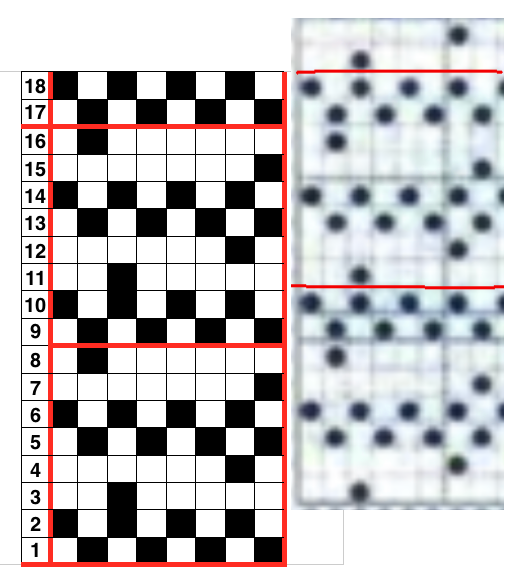 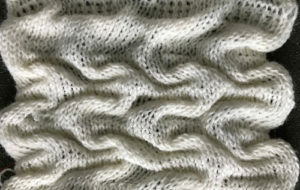 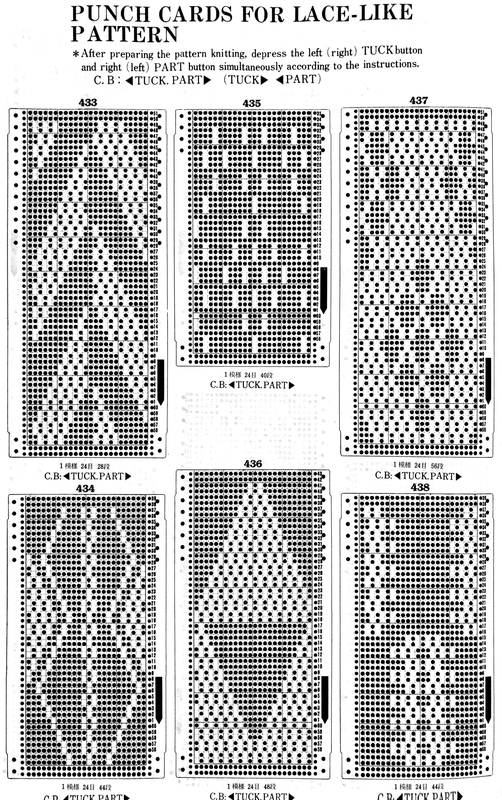 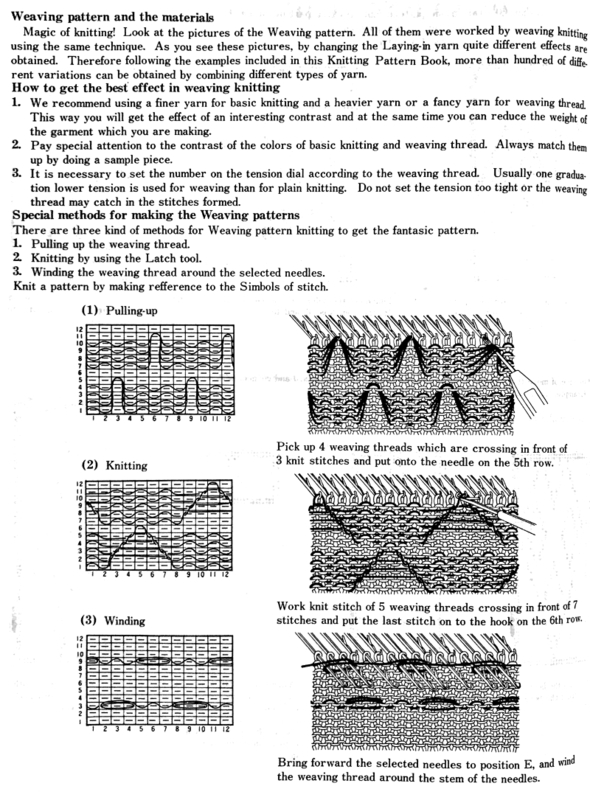 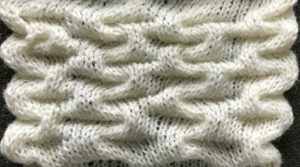 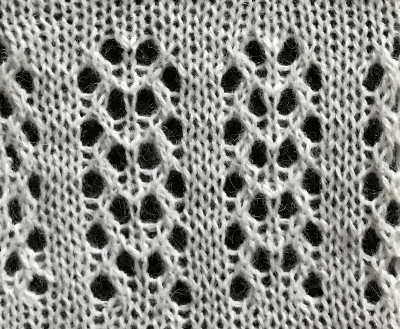 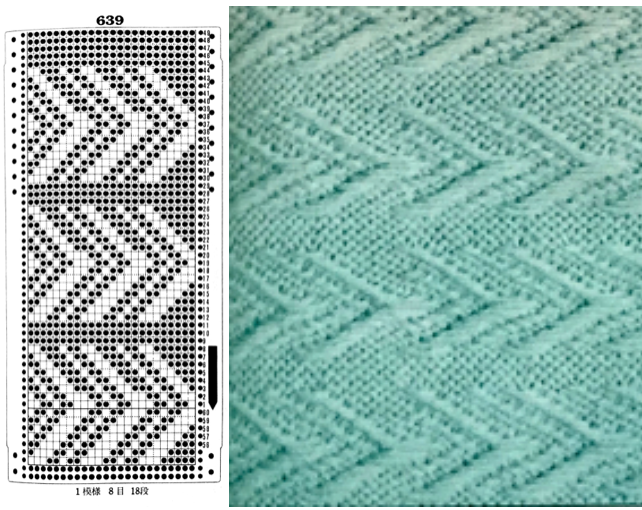 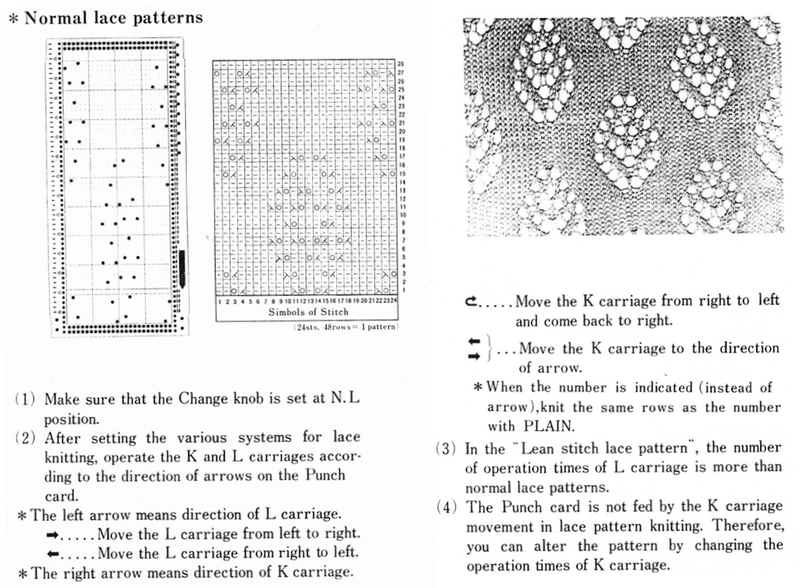 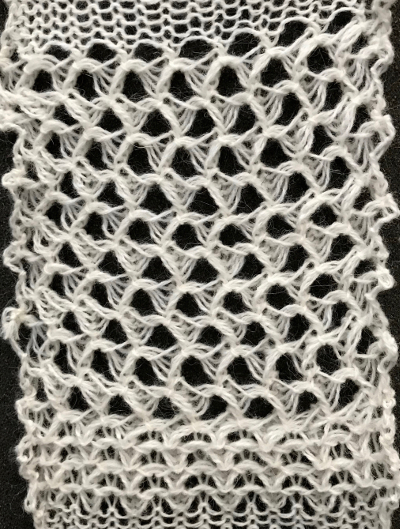 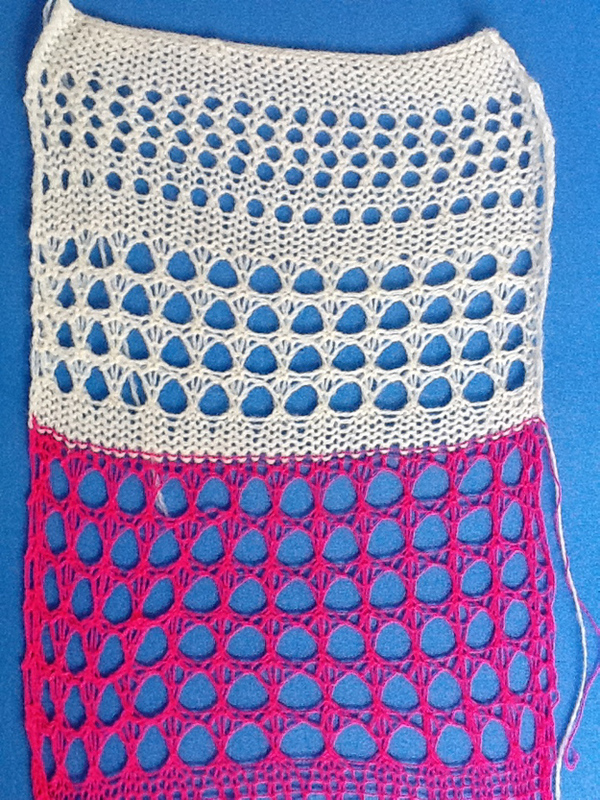 There have been several previous posts on “crochet” like stitches and “tuck lace”, this is another variant. 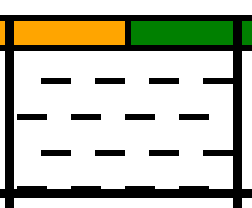 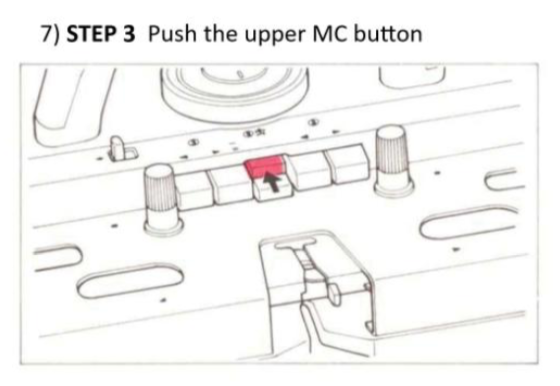 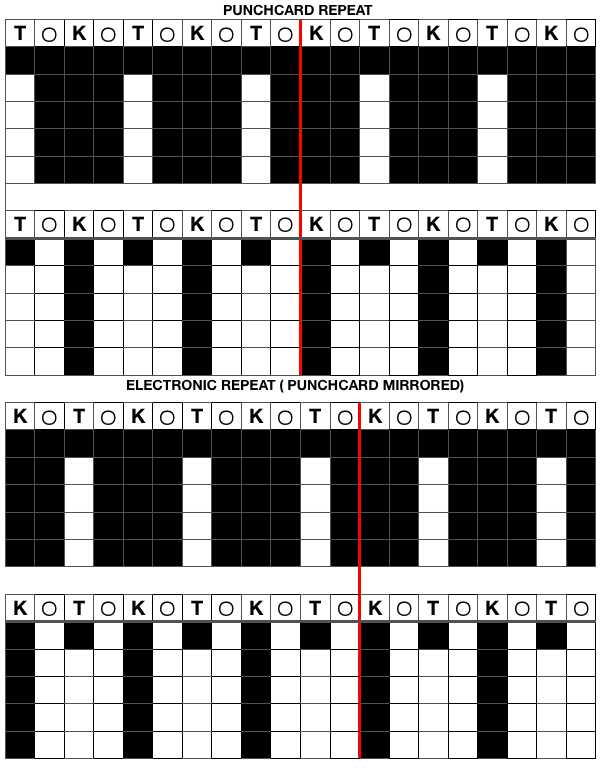 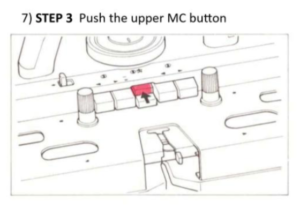 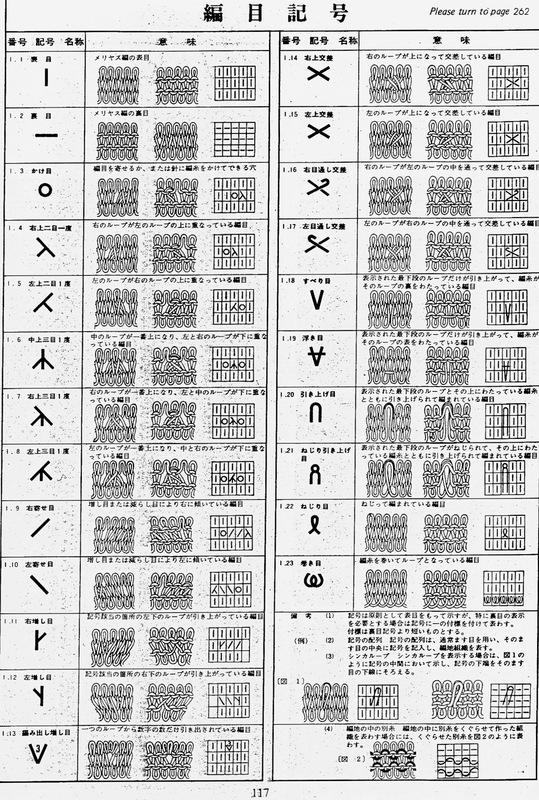 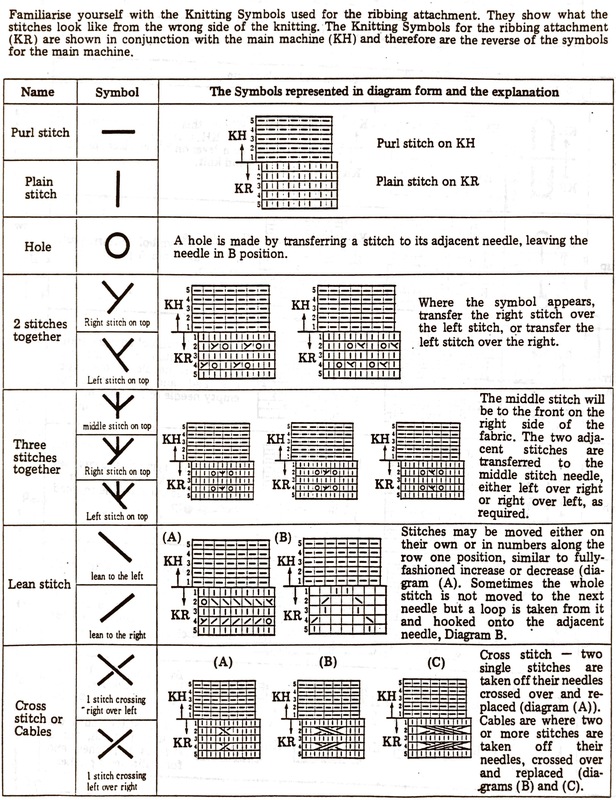 The needles need to be arranged as in the diagrams below. 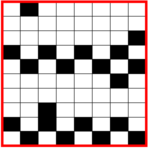 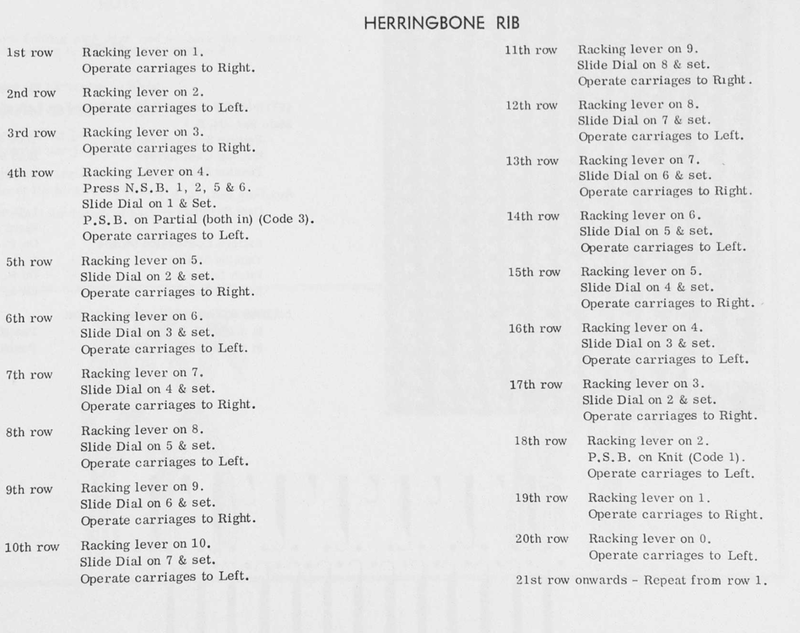 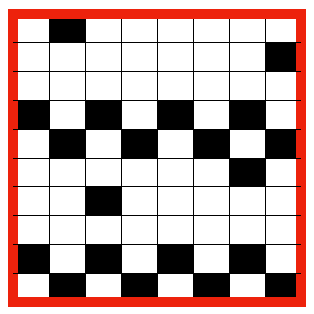 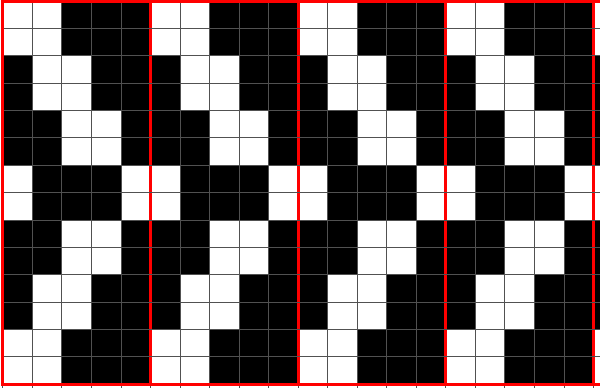 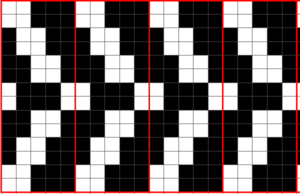 After the first preselection row, the carriage is set to tuck <– –>. 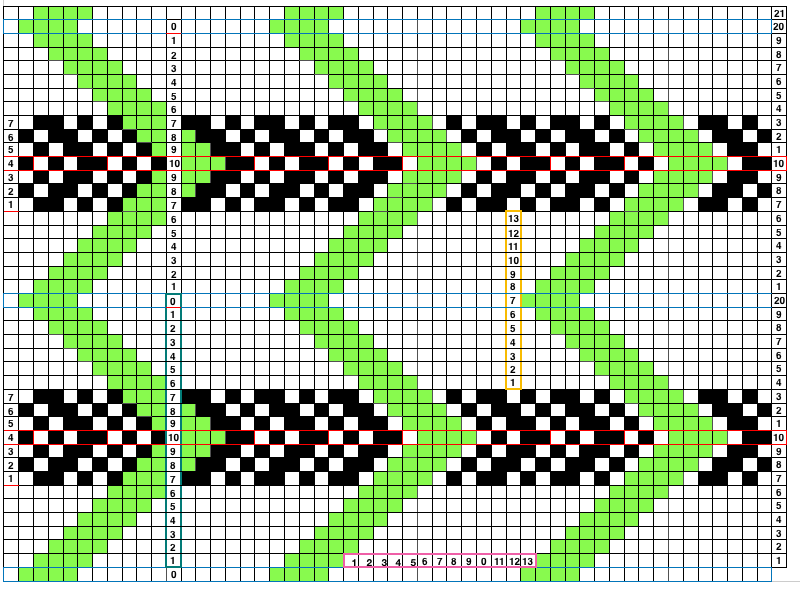 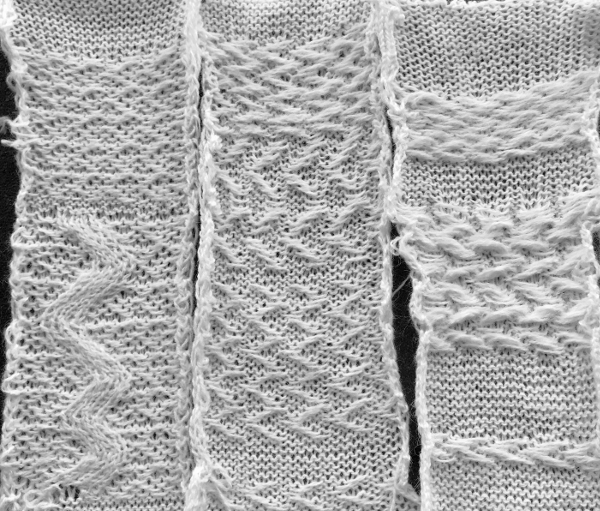 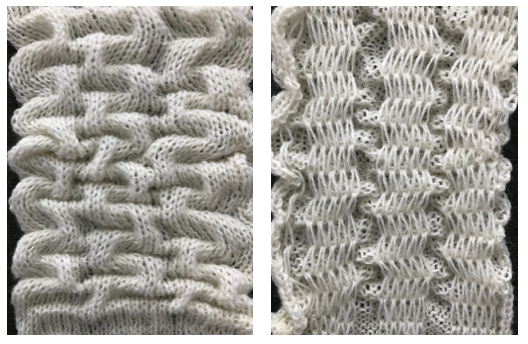 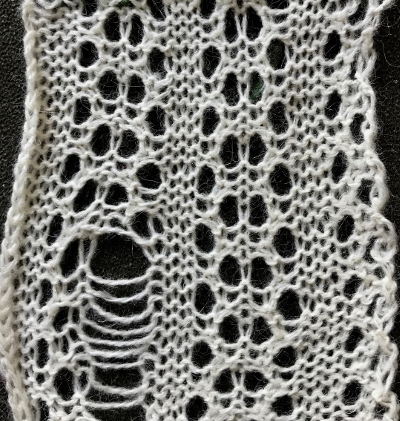 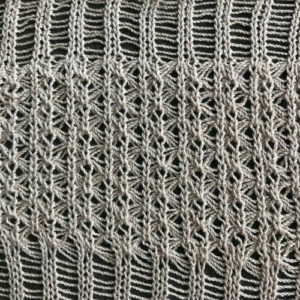 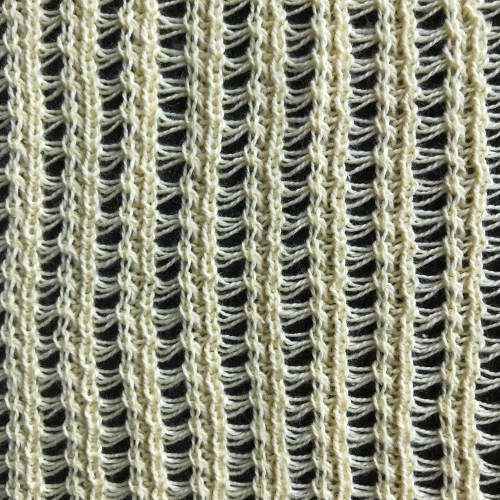 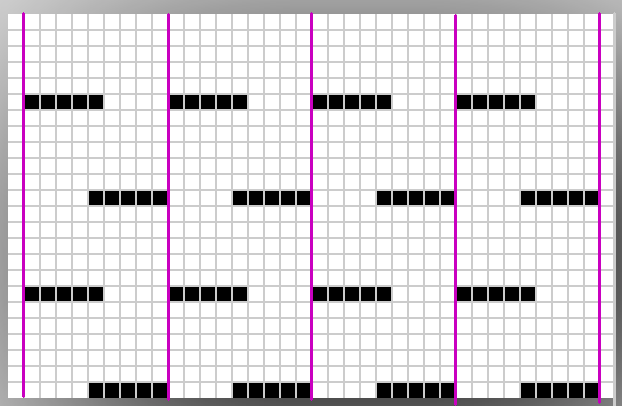 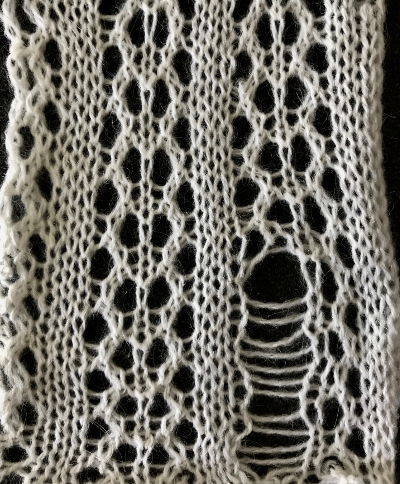 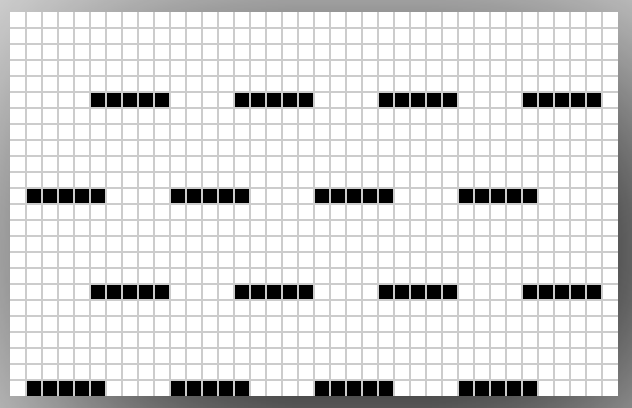 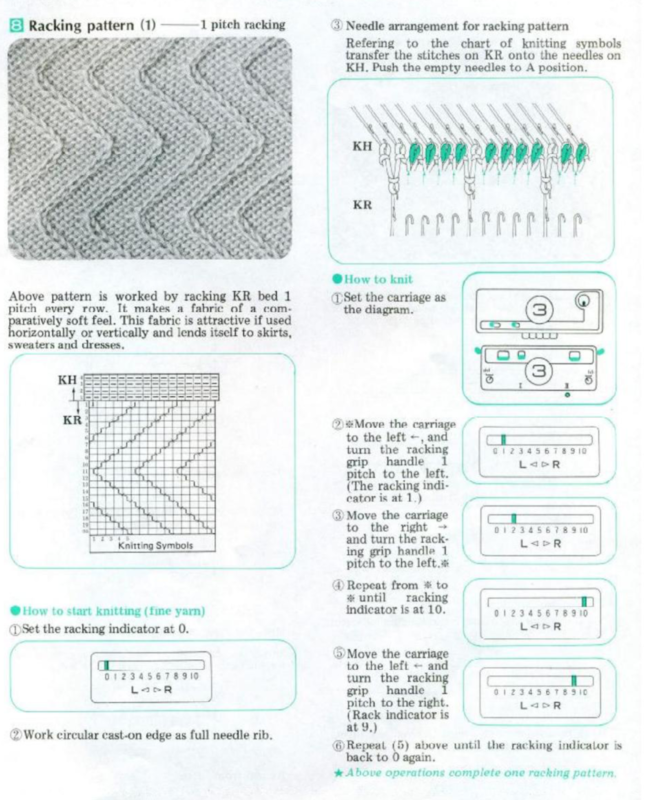 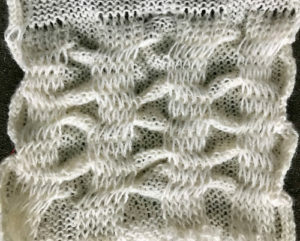 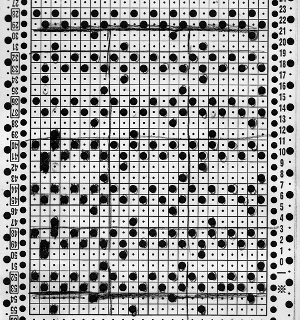 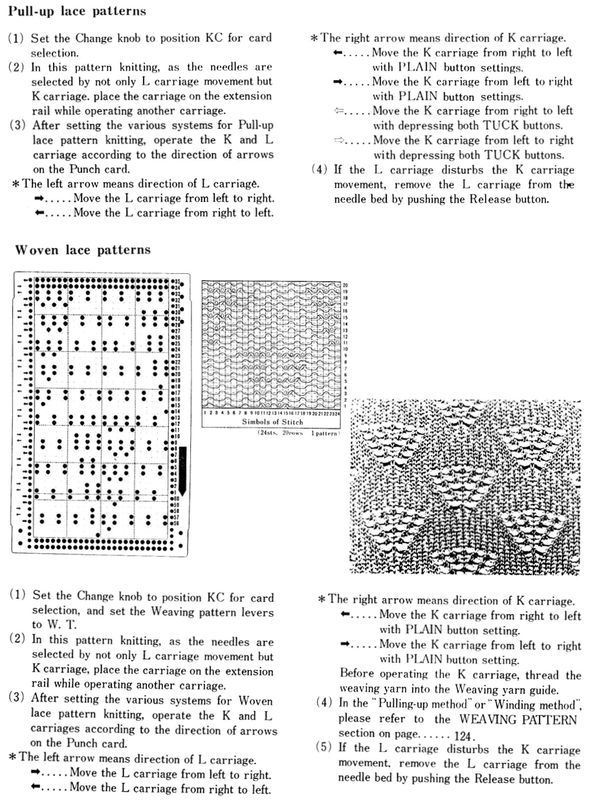 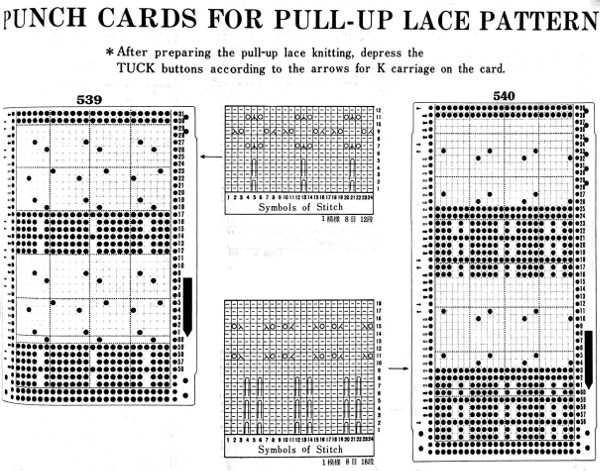 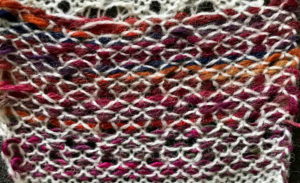 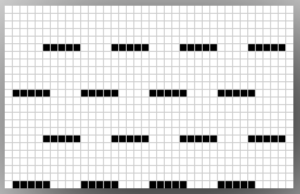 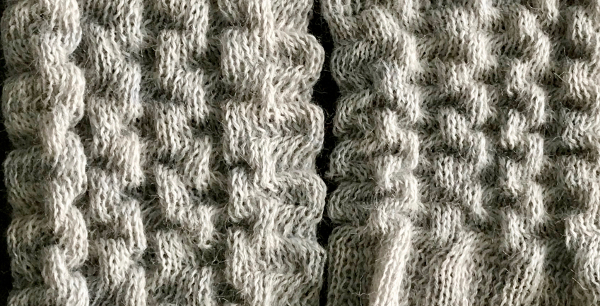 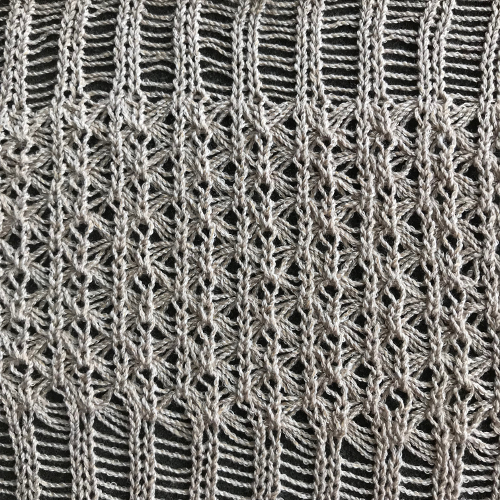 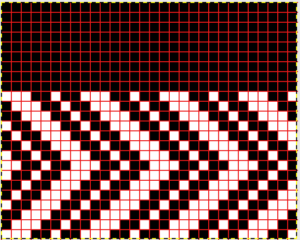 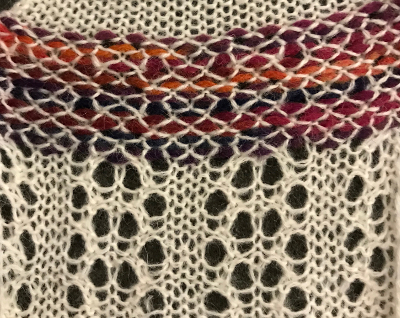 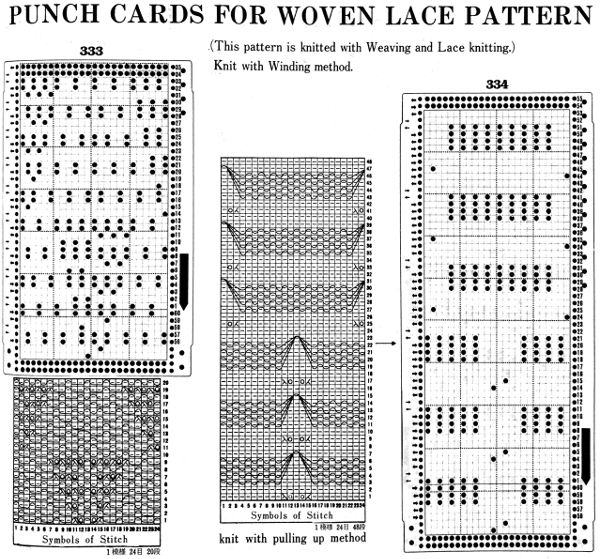 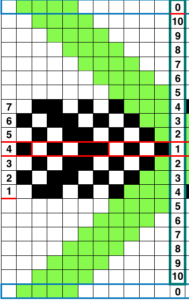 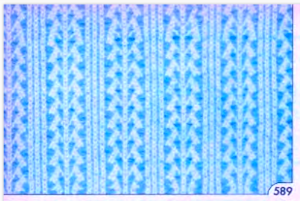 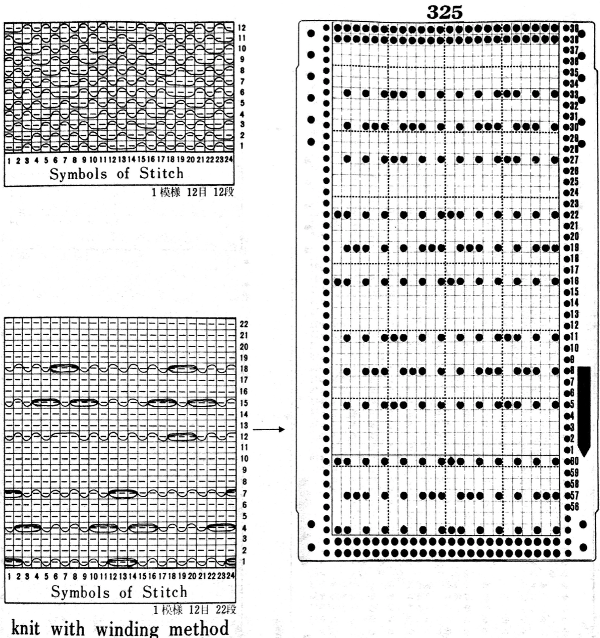 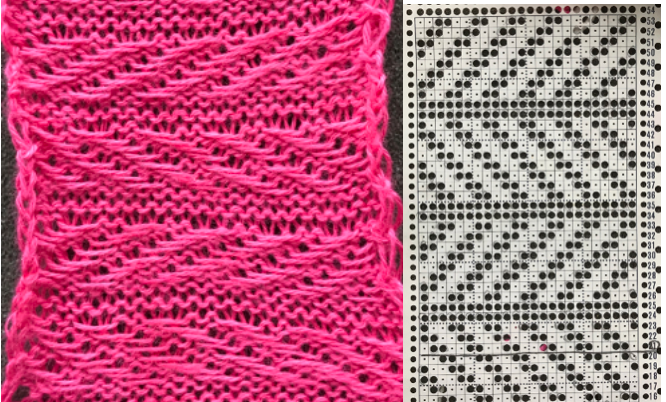 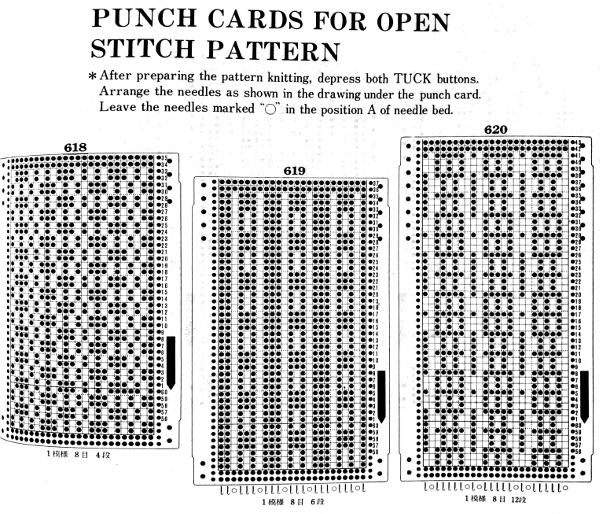 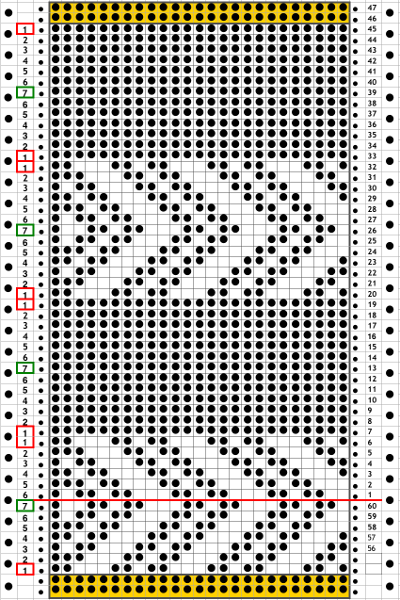 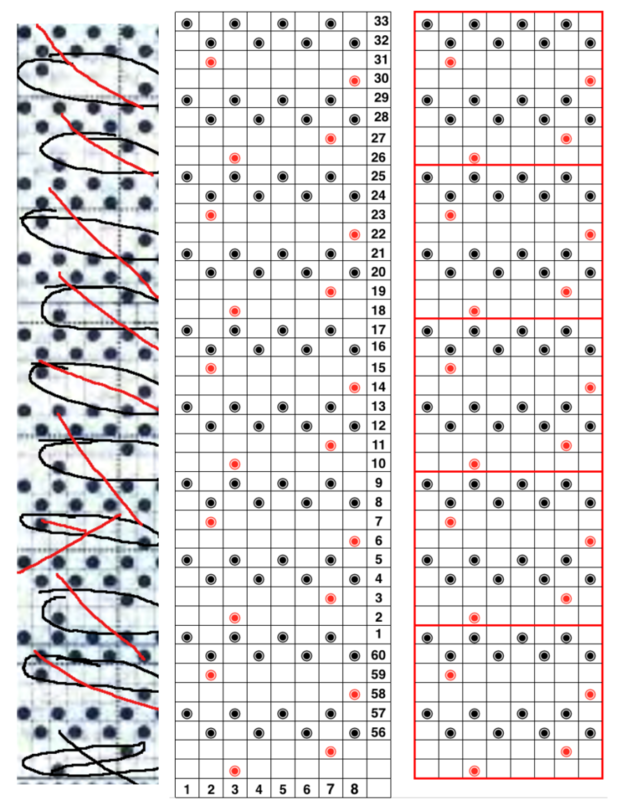 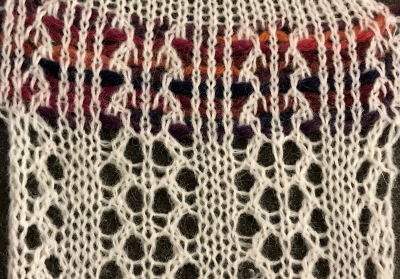 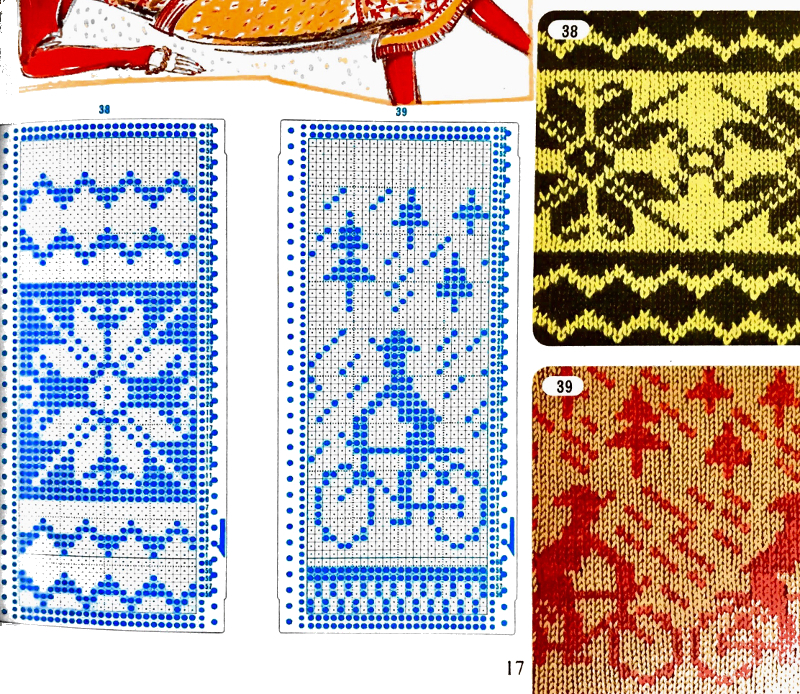 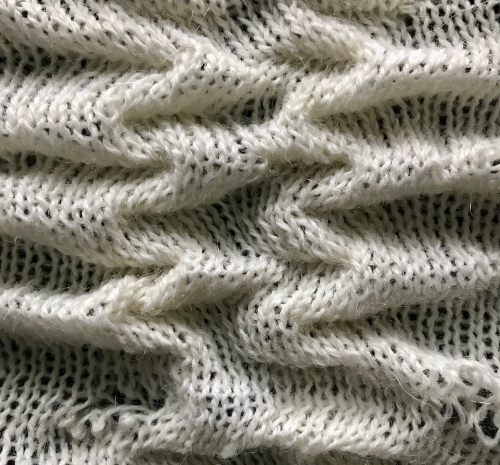 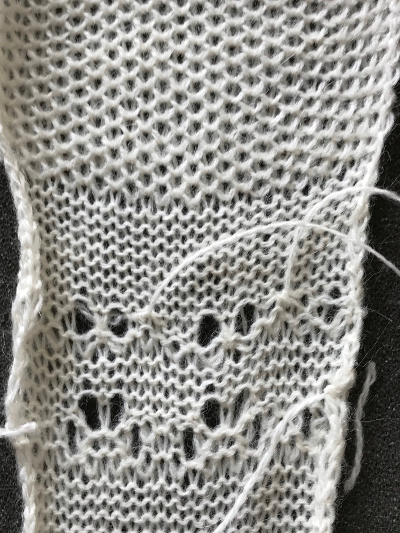 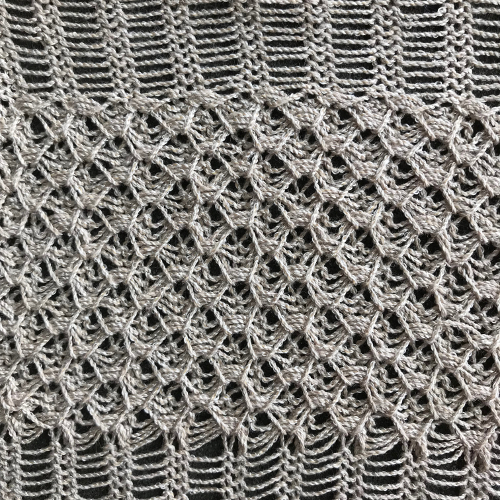 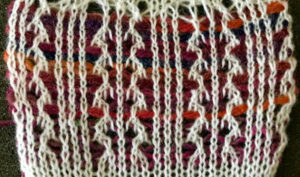 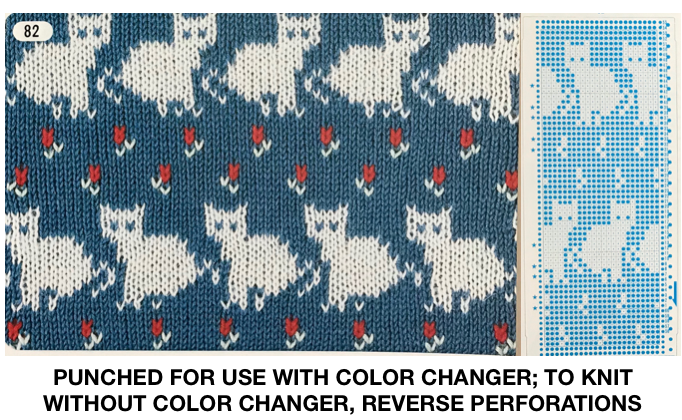 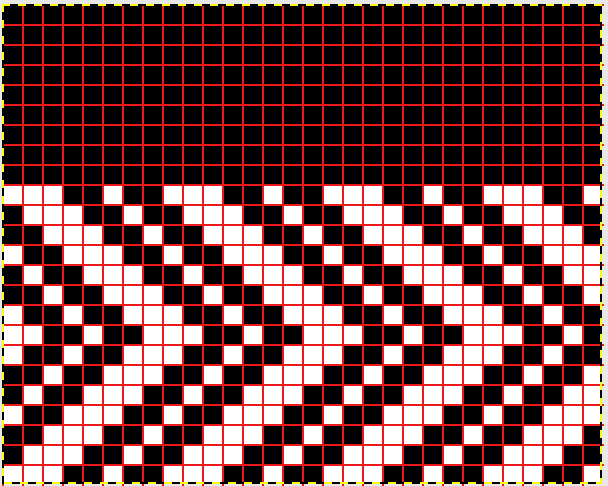 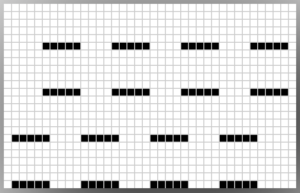 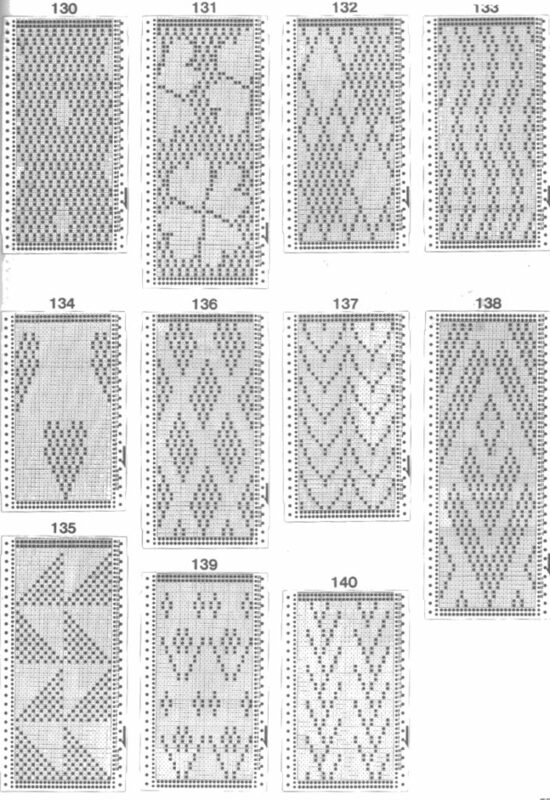 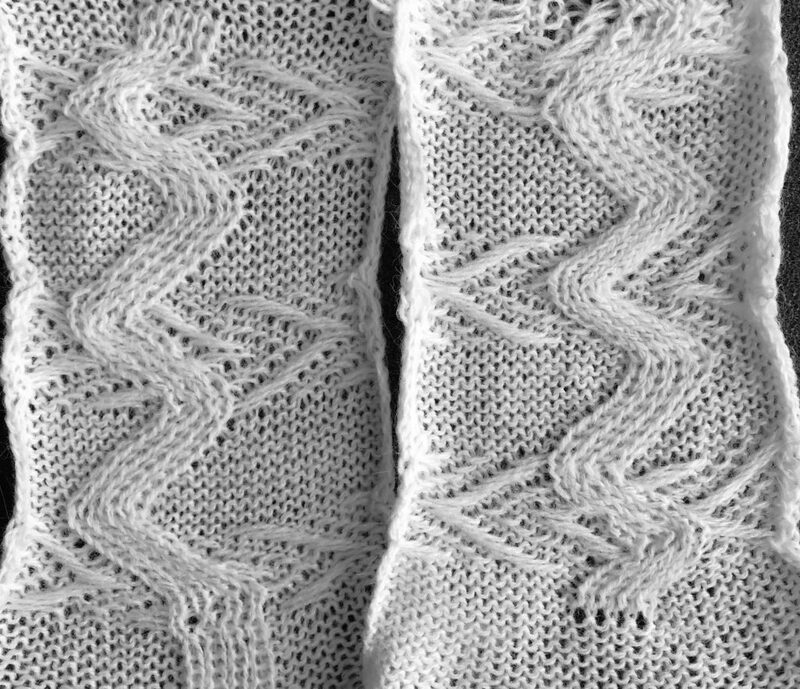 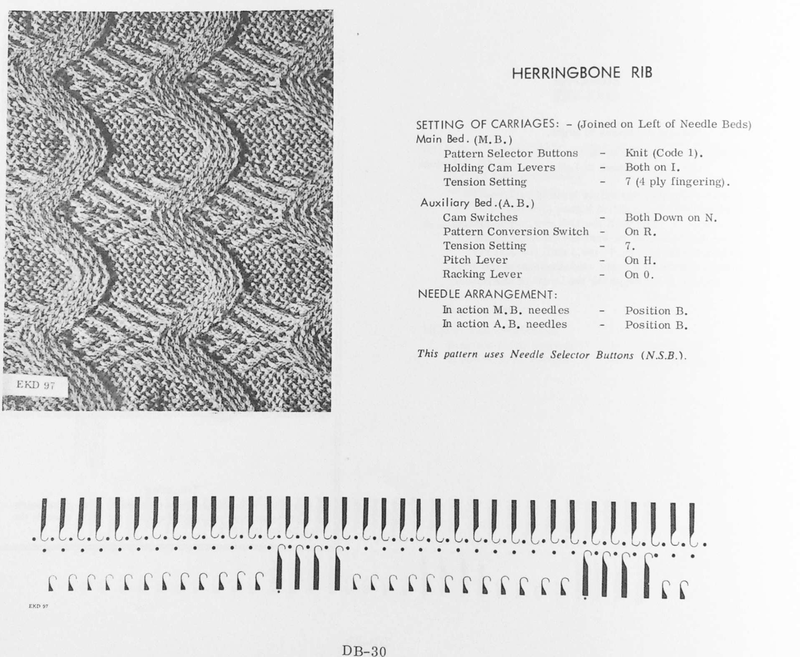 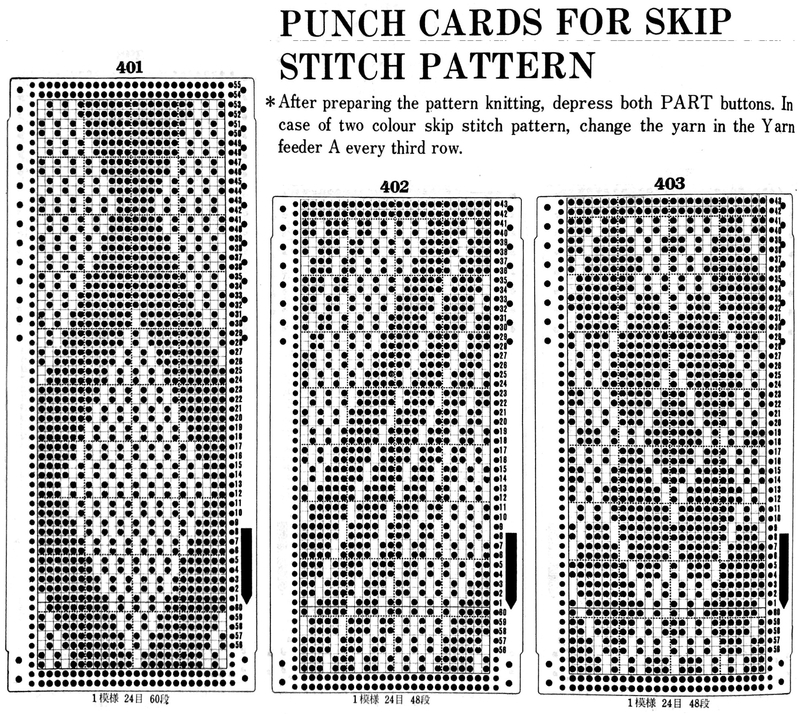 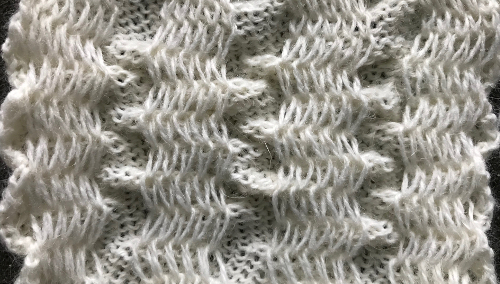 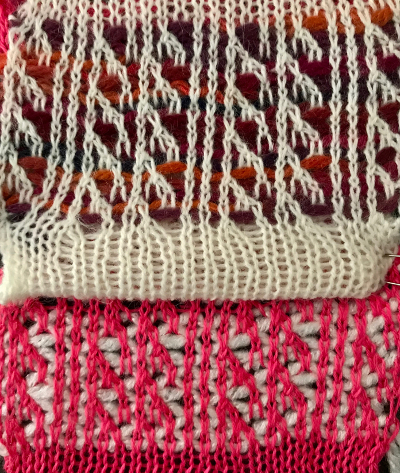 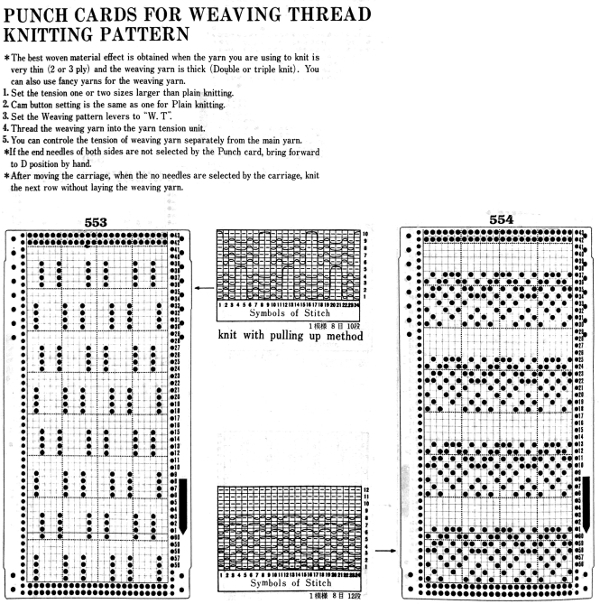 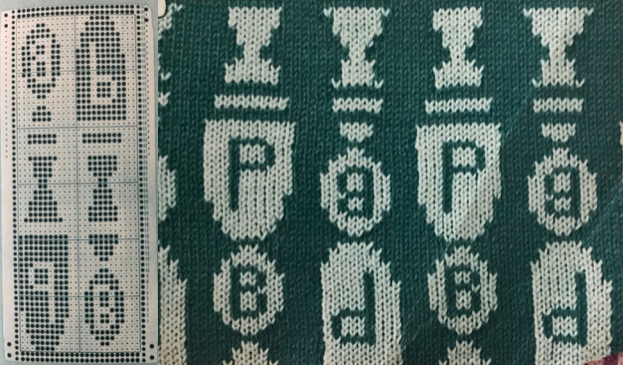 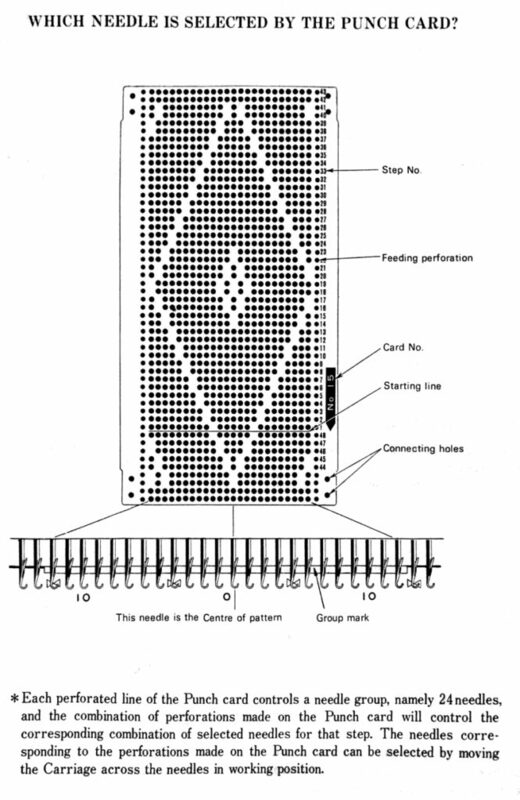 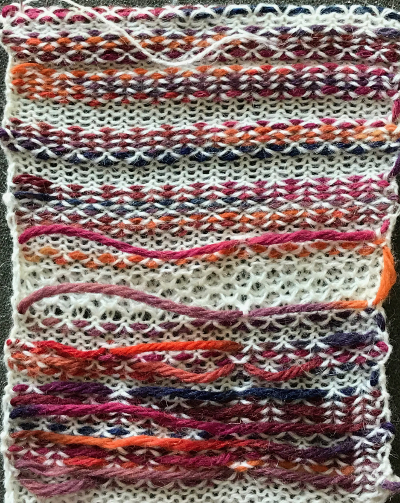 Every 5 rows, after the tuck loops are knit together (illustrated in repeats on far left), the formed stitch (single black square) is transferred in turn to right and then to left; this works out happily so that transfers may always be made toward the knit carriage. 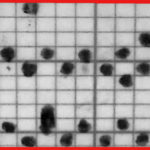 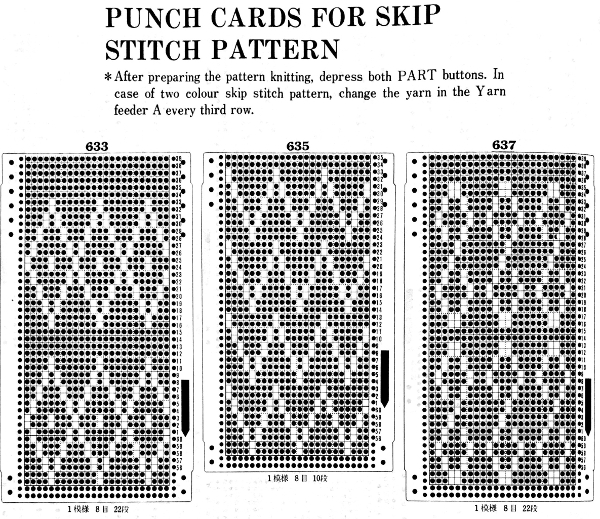 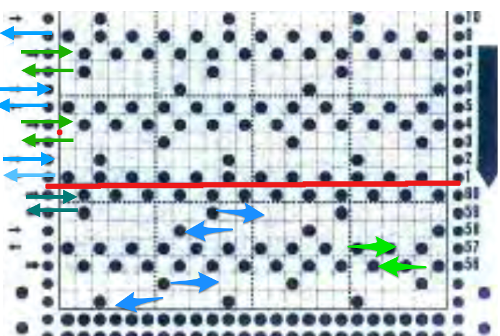 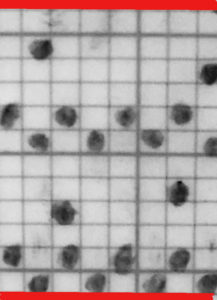 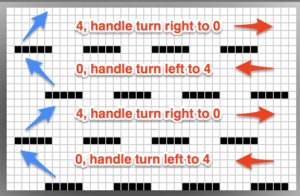 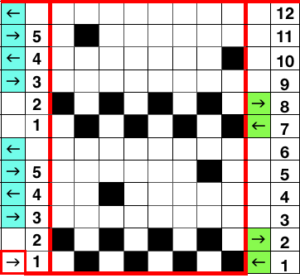 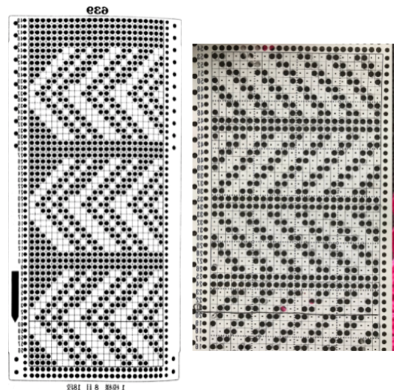 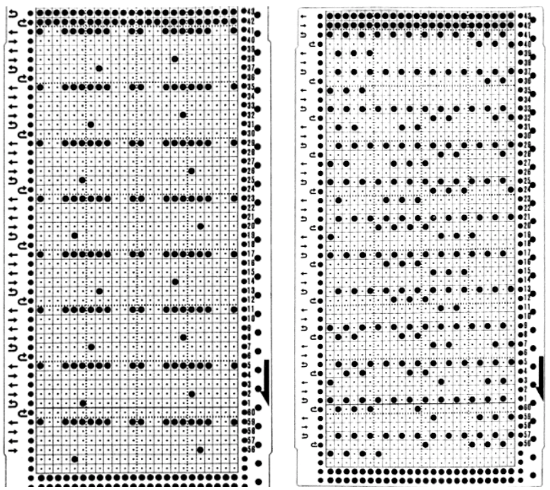 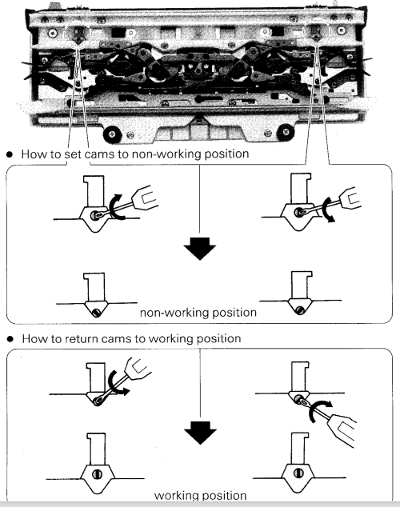 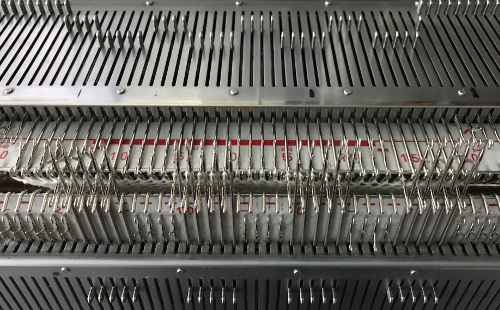 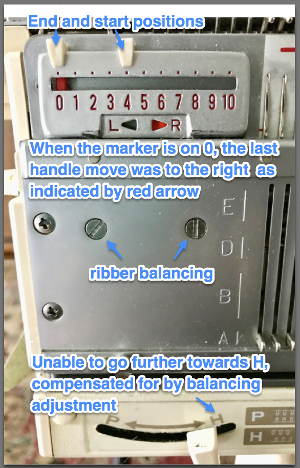 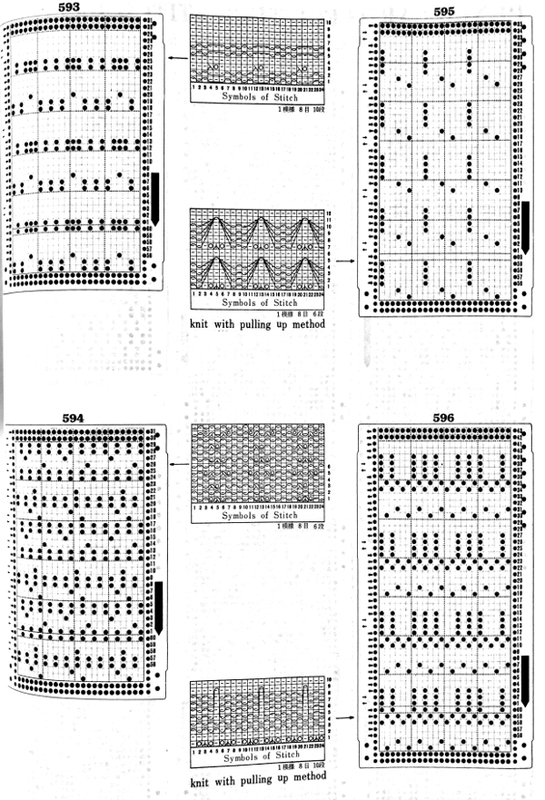 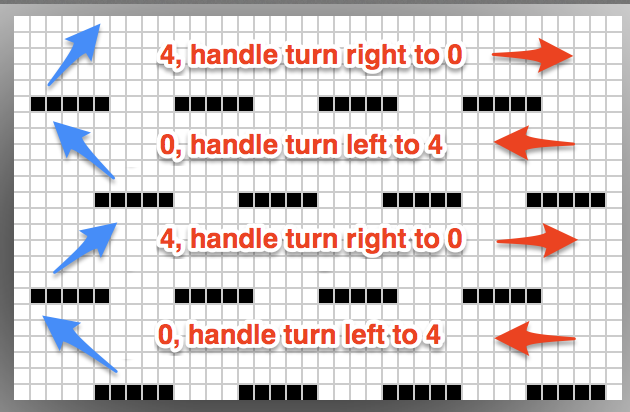 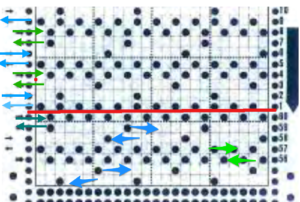 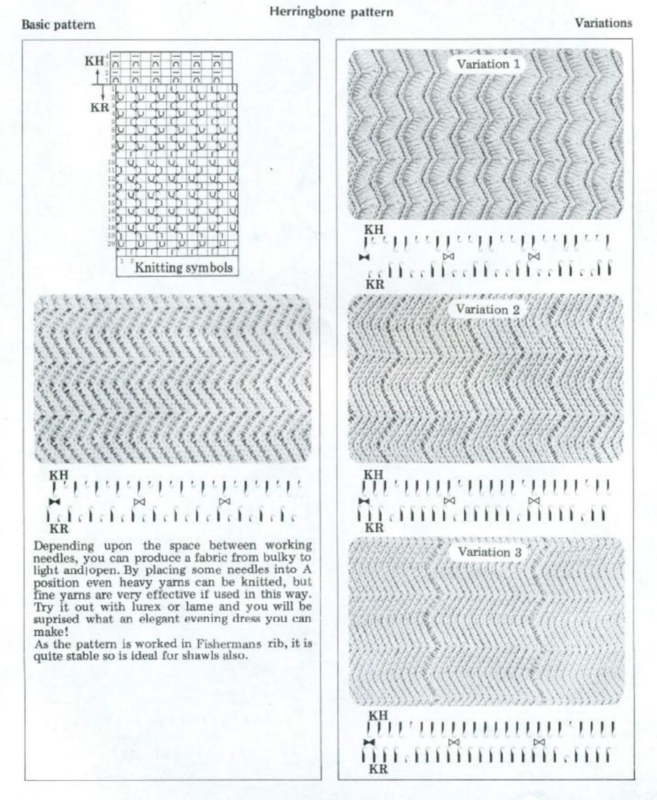 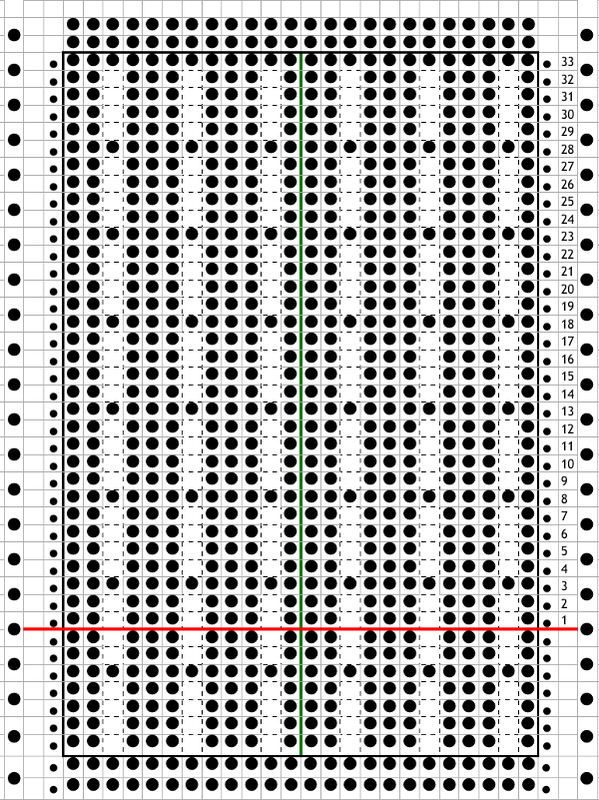 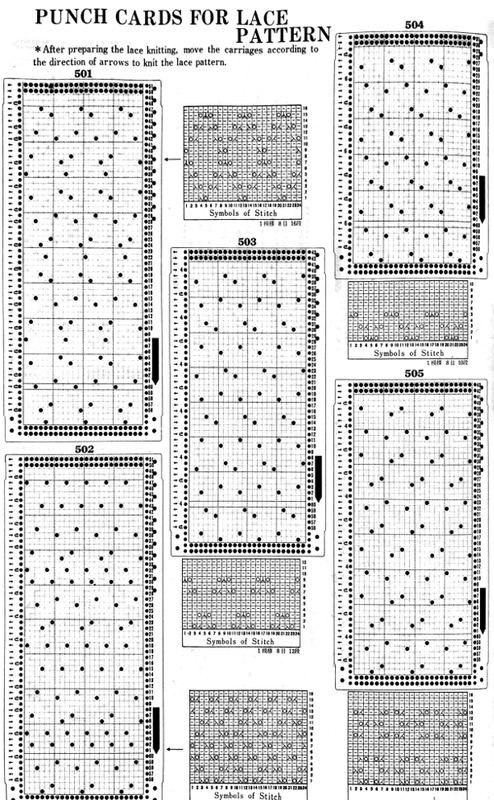 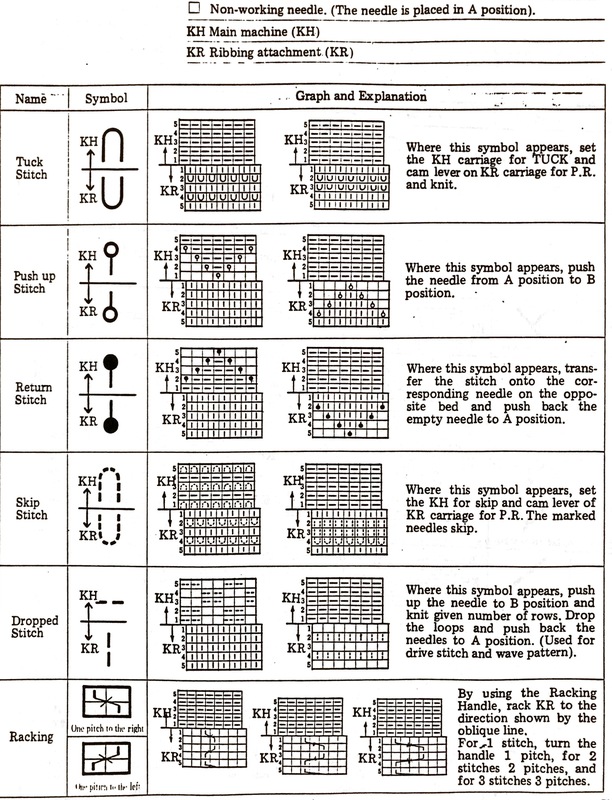 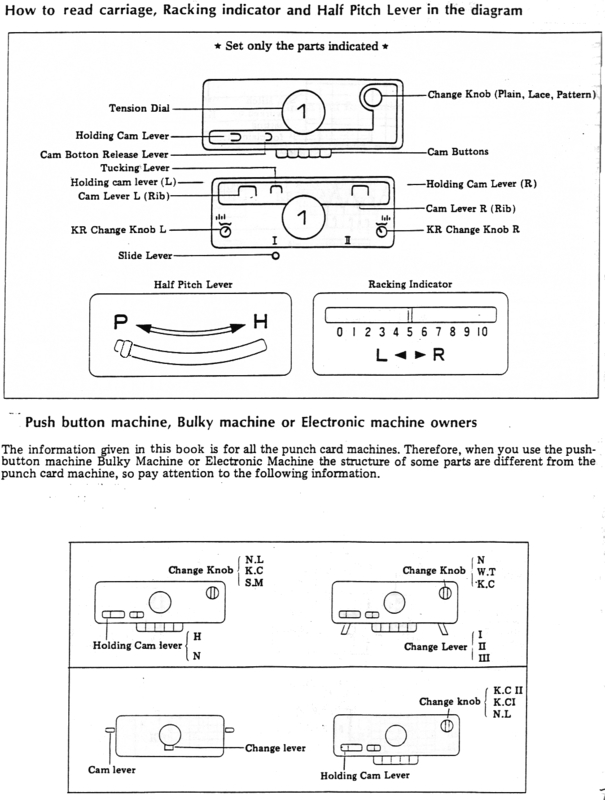 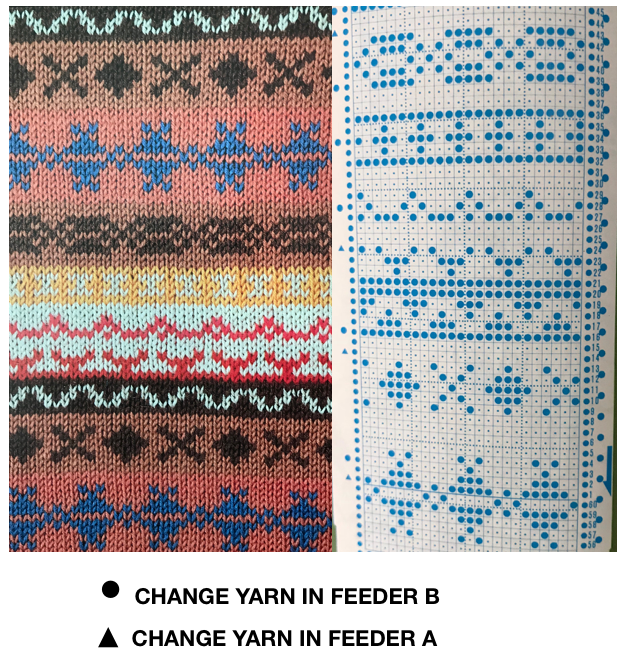 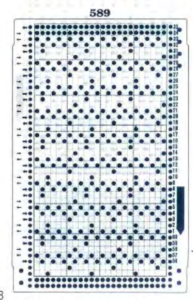 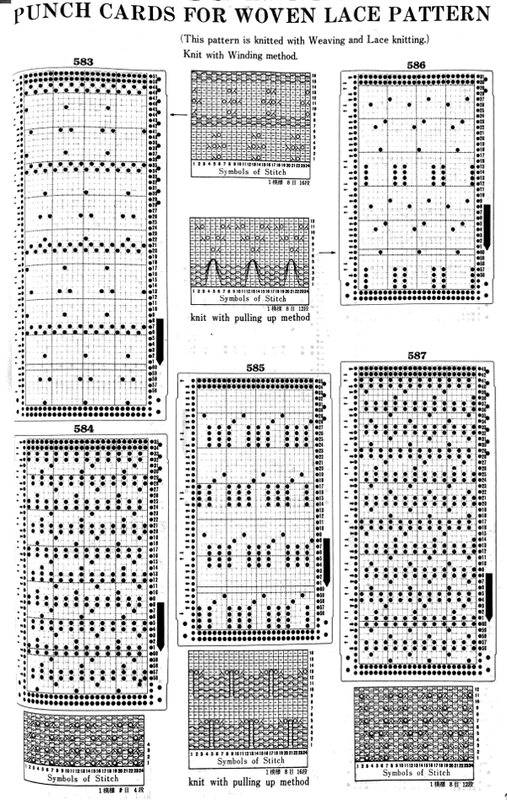 If you prefer to work with the top repeat programmed, then transfers will need to be made on each side of the non selected needles to get the proper configuration. 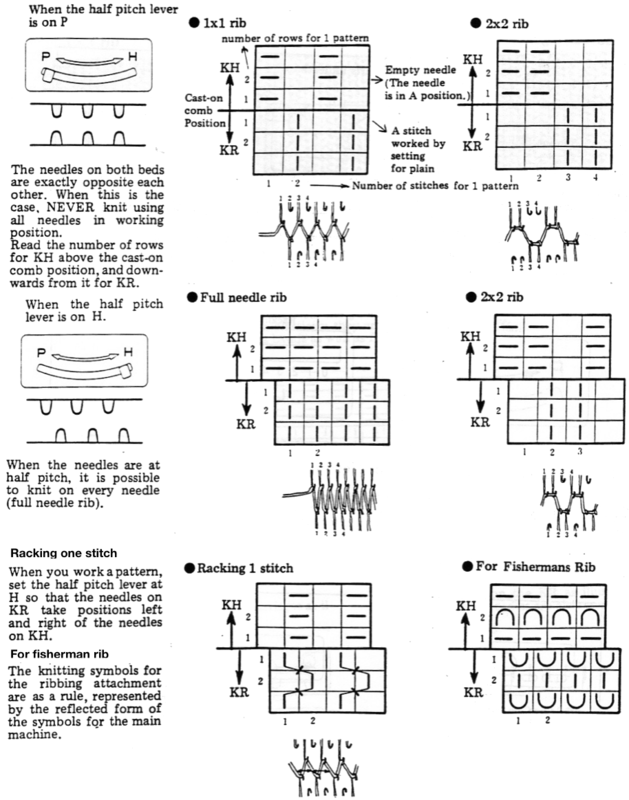 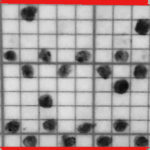 If programmed with the bottom repeat, then and every other needle cast on is fine. 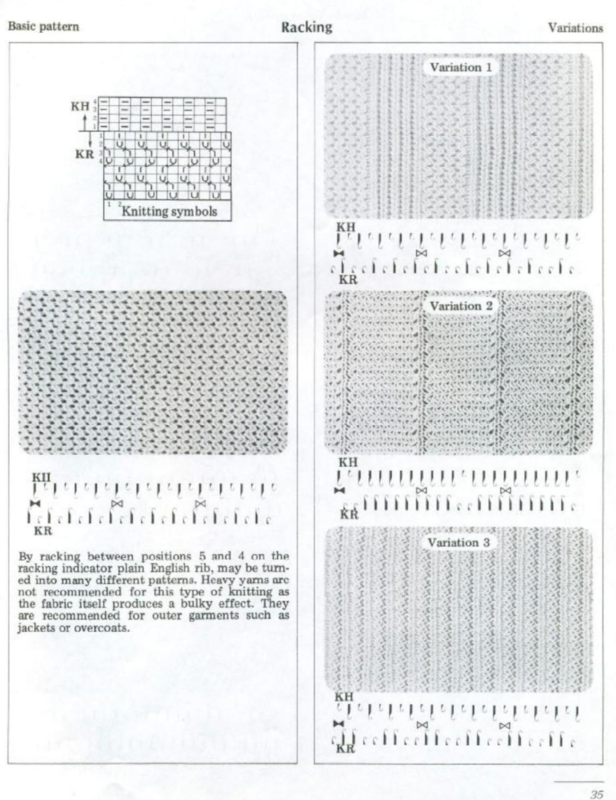 I generally stay away from combs and weights if I can, but this is a fabric that benefits by evenly distributed weight, a cast on comb with weights added to it is a good idea. 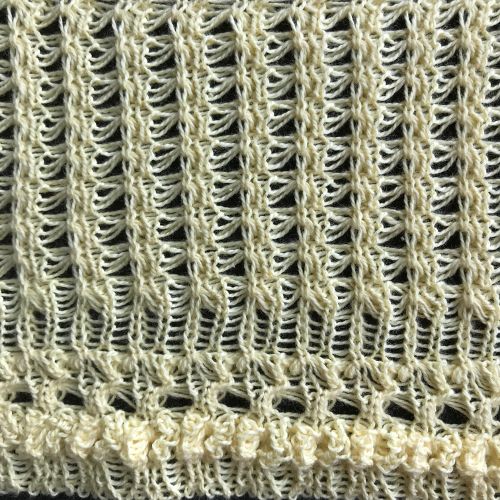 In the absence of any, start with waste yarn and ravel cord, thread a thin knitting needle or wire through the knit, and hang evenly spaced weighs on that. 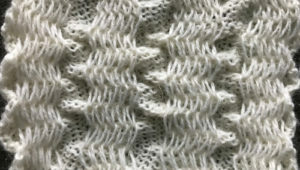 Follow with your preferred cast on, and knitting in pattern.